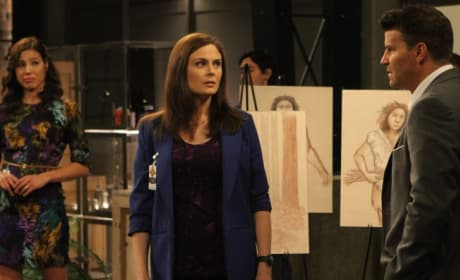 Booth, Brennan and Angela in a photo from Bones' 11th episode of Season 8, "The Archaeologist in the Cocoon," airing 1/14/2013. Another quality photo from Bones' 11th episode of Season 8, "The Archaeologist in the Cocoon," airing 1/14/2013. Brennan in a photo from Bones' 11th episode of Season 8, "The Archaeologist in the Cocoon," airing 1/14/2013. A photo from Bones' 11th episode of Season 8, "The Archaeologist in the Cocoon," airing 1/14/2013. Hodgins and Brennan in the field in a photo from "The Archaeologist in the Cocoon," airing 1/14/2013. Brennan and Hodgins in a photo from "The Archaeologist in the Cocoon," airing 1/14/2013. [to Sweets] Why is when I ask you something it's never about what I'm asking you about? Hodgins: Eh, it does look humany. Bones: Sorry to disappoint you. Permalink: Eh, it does look humany. Sorry to disappoint you.